A a rough documentation of the workday on Sunday January 7th, when 185 more crosses were added to the memorial. Now over 1200 crosses are present on the hill. 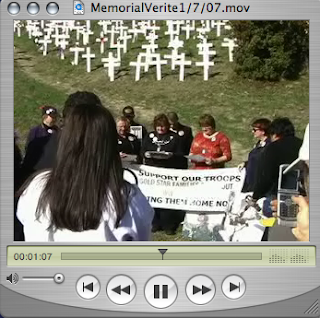 Three Goldstar Mothers, who have children who died in Iraq, came to mourn and show their support for the project. They spoke and read names of soldiers killed in the war. The video includes short clips from an interview with organizer, Jeff Heaton. A note on quality: My video compression software is down. As soon as I can make the picture better, i will.